Carving on ancient brick tower, Sarnath, near Benares. bl.uk > Online Gallery Home	> Online exhibitions	> Asia, Pacific and Africa Collections	> Carving on ancient brick tower, Sarnath, near Benares. 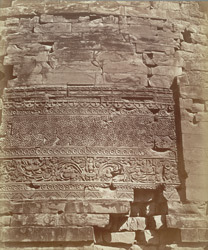 Photograph of the carvings on the Dhamekh Stupa at Sarnath, from an Album of Miscellaneous views in India, taken by Thomas A. Rust in the 1870s. Sarnath is the sacred place where the Buddha preached his first sermon known as the Wheel of Law, the Dharmachakra in the sixth century BC. The Dhamekh stupa marks the site of the sermon. It is a cylindrical tower more than 30 metres (98 feet) high. "Gupta designs are incised high onto the drum; these include luxuriant foliation with stalks, leaves and flowers, birds and various geometric patterns". While the foundation date of the stupa is unknown, excavations have revealed that there were six successive enlargements, the last of which was in the 12th Century. The site is one of the leading pilgrimage places of Buddhism. This is a view showing detail of carving on the Dhamekh stupa.